This dashboard monitors a multi-tiered web application. 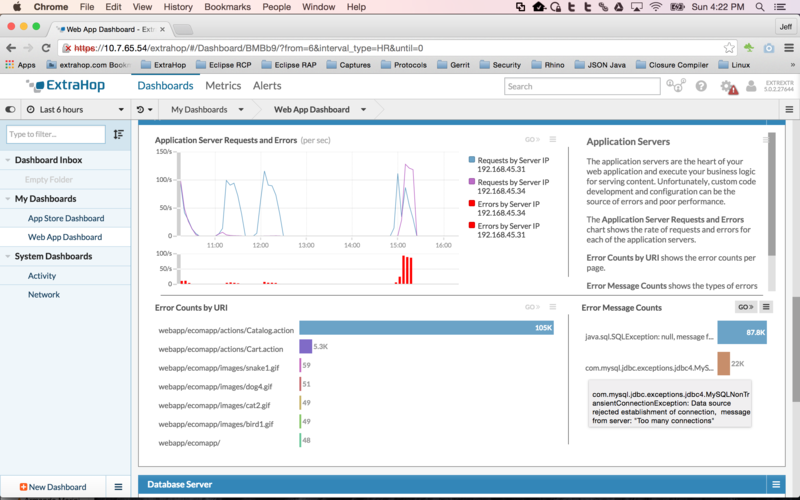 Get immediate status of your load balancers, application servers, and database servers using this dashboard. Read the accompanying blog post for more details. *Available if Java exceptions are exposed to the web page. Load balancer, application server and database server DNS names must be known for configuration of the dashboard. For results related to Java exceptions and stack traces, the application server must be configured to expose these exceptions. See the blog post in the description for details. Download, upload and apply the bundle. Go to the Web App Dashboard. In the Customer Experience region, edit both the Web Error and Average Server Response widgets by configuring your load balancer DNS name (or IP). Maintain the same metrics. In the Load Balancer region, edit both Load Balancer Activity and Load Balancer Response Times widgets by configuring your load balancer DNS name (or IP). Maintain the same metrics. Also in the Load Balancer region, configure the Application Server Distribution widget for your application servers. In the Application Servers region, configure the Application Server Requests and Web Errors widget for your application servers. Also in the Application Servers region, configure Error Message Counts for your network capture interface. In the Database Server region, configure the Database Server Errors widget for your database server. Maintain the same metrics. Also in the Database Server region, configure the Database Connections per App Server widget for your application servers. Maintain the same metrics.